Just a quick post for the stroganoff I made a couple of days ago. I remember mom making a quick hamburger stroganoff when we were kids and this is my version. Combine ground beef, sliced mushrooms, and onion in skillet; cook until mushrooms are tender and beef is cooked through. Add garlic, salt, pepper, paprika, crushed red pepper, marjoram, stock, ketchup, Worcestershire, and bay leaves. Bring to simmer and reduce heat cooking for about 10 minutes. Combine cornstarch and cold water. Remove bay leaves and stir cornstarch mixture into simmering skillet; stir until thickened. Take a spoonful or two of the hot stroganoff and stir into sour cream until blended well (this will temper the sour cream to keep it from curdling). 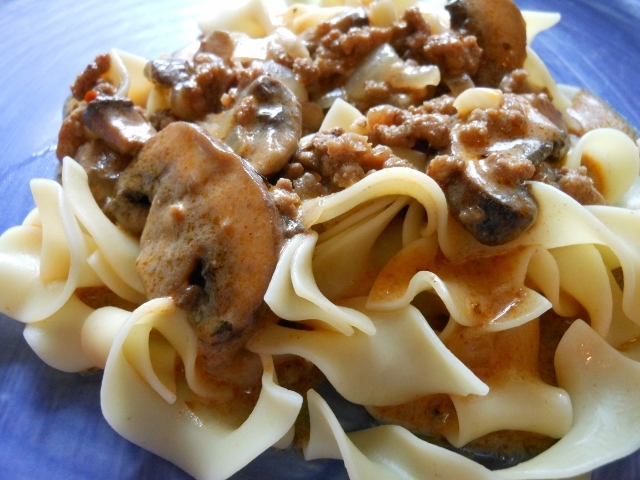 Stir sour cream mixture into hot stroganoff; heat through and serve over hot noodles.